First up: here's the video in question. Now then: this mystery come to us from the United Kingdom. Specifically: Bournemouth, Dorset on A338 Wessex Way. I'm ashamed to admit I woke up a friend up at 3 A.M. asking them where all of this was because Google decided that I was looking for a Wessex Way in California or the official name to this creature. If the friend is reading this: I apologize and hope you slept well in spite of me being an idiot. Anyways, this weird little creature is an enigma. It's not like your everyday Bigfoot or Chupacabra. Rather, it was a sort of “one and done” that was seen by CCTV and subsequently went off to either die or go hide out in some remote forest. As the picture at the start shows: it's a four-legged creature like a dog or even a Chupacabra. However, it doesn't appear to have fur, something that'll be relevant later. When this footage was first seen, the immediate impression most had was that it was a hoax. However, paranormal investigators went to the bobbies (I'm not sorry) and were informed that the footage was genuine. And that's where our story ends: a weird four-legged thing that came and went. No more, no less. So let's try to lay this mystery to rest. Our first theory is that it was the product of photoshop editing. Here's something that I'd normally believe, but I'm hesitant to say is right. While clever editing can result in some really convincing hoaxes, the probability of this CCTV being fake I'd say is low. Some may point the car not reacting to the creature as evidence, but I'd argue that it was moving so quickly that they didn't have time to react. It's not this was a deer; it didn't stop and look at the car like a dumb-dumb. It seemed confident in its movements and covered the ground ridiculously fast. Though who knows, perhaps it is fake and naive. Theory two is that it was The Rake. Ah, one of my favorite creepypasta monsters. The Rake, much like Slenderman, is a creature that's seen itself enter the real world thanks to misidentification or something similar. While some may say that the mere collective belief of the creature is what's caused it to be seen in the real world, I'd argue that an escaped government experiment is more likely than that. I digress though. The Rake, for the uninitiated, is a pale/flesh colored creature with a slender body, long claws, and large pupil less eyes. Although it's bipedal in nature, it's often seen on all fours stalking its prey—which adds to its more animalistic characteristics and personality. Overall, The Rake is a very standard, but very effective monster. Primal and ghoulish in appearance and scary; perfect for a scary story. However, that's all it is. A monster from a scary story. Sorry to those who are certain that The Rake raked their front lawn. It didn't. It was likely a bad dream or a malnourished person. Or your imagination. The third theory is where the hairless aspect comes in: that our weird highway crosser was a canine with mange. Arguably the most likely explanation: canines with mange are what's often applied to the Chupacabra. The hairless appearance of the creature is what leads me to believe this theory, though some may question as to why the creatures front legs are bent backwards. We'll get to this a bit later. For now, let's continue onward. Theory number four is that it was an alien. Admit it: you saw this coming. The United Kingdom is no stranger to UFO sightings. In fact, I think it's a hotbed for them. Simultaneously however, I don't believe they're prone to alien sightings. Sure, there's Stonehenge and Crop Circles, but correlation and causation. One doesn't mean the other will be there. That's how that works, right? Anyways, the movement of the creature is definitely odd—some may even say alien. However, attributing every weird creature and cryptid to the work of aliens—or being an alien—isn’t exactly the smartest thing I'd say. It's one of those things that I feel makes people look down on Cryptozoology. As a result, this theory is like bunk. Nay, it is bunk. Theory five is that it was a werewolf; the beast of legend said to be part man, part wolf. Naturally, they sport the fur that wolves have, among other things wolves have. That would naturally make this theory dead on arrival, but some argue that the person was in the middle of the transformation. Others also argue it may be a fallen angel of something akin to that. You decide, but I'm doubtful in spite of the second most popular name given to this creature: The Wessex Way Werewolf. The sixth theory is that it's a Skinwalker; the Native American creature of legend and what some say may in fact be real. The Skinwalker is, in my honest opinion, one of the scariest stories ever. It's a creature that can take on the appearance of whatever its last victim was, albeit imperfectly. It's convincing enough that one typically won't notice said imperfections. It can also mimic the last words it heard from said victim; usually blood curdling screams or cries for help that lure friends or family deeper into a forest. There are some variations to the legend. For example: some say that what I've described fits the Goatman. I digress though, while the Skinwalker is of Native American legend, stories of shapeshifting monsters aren't restricted to just the US. As such, the prospect of one being in the UK isn't outlandish… origin wise anyways. While the creature in the video does match the standard appearance to a Skinwalker (lanky, humanoid-esque, and furless), there's never been any evidence to back up their existence. And even though I'm of the strong opinion that legends had to have come from somewhere, I'm not putting much stock in this thing being a Skinwalker. Theory seven is that it was a kangaroo. Yeah, I don't know how one got to the UK either. Perhaps an escapee from a zoo? An exotic pet? I don't know, but I don't believe kangaroos move in a way like the creature in the zoo does. I'm also certain an escaped kangaroo would make the news as they're rather dangerous from what I know. Inform me if I'm right or wrong please. Theory number eight is that it's some interdimensional. Apparently, nasajim108 wasn't crazy and there are interdimensional beings here to take us over. Memes aside, I'm not making this up. Go ahead and look at the comments to the video above. There are people who say that beings that feed on negativity have manifested in similar fashions to the creature in the video—be it in their homes or elsewhere. Now, I've heard stories like that before. Typically, they're said to be demons; beings that grow stronger thanks to hate and fear, though some may say they're “interdimensional beings” or even aliens. Sometimes, they're one in the same. Regardless, the evidence for this theory is a mixture of personal accounts and the sudden manner the creature appears in. One can argue that CCTV footage isn't perfect, but that'll get nowhere as believers in these sorts of things are usually very adamant in their beliefs. All of that said: I leave this theory up to you. Personally, while stories like this aren't necessarily uncommon, they never cease to come across as some of the weirdest stories ever. But hey, I personally can't disprove them. 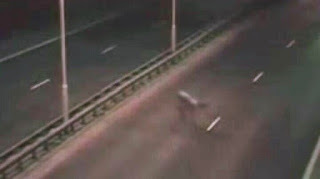 Our ninth theory is that it was a ghost; perhaps the spirit of a car crash victim who was disfigured in an accident or struck by a motorist, or some other horrible event. This theory, while I personally can't find any evidence for it, more or less stems from the stories of spirits that haunt roads they died on. While I personally doubt this, I leave it up to you to decide if it's possible or not. Ghosts are subjective in nature and as such, I'll let it stay that way. The tenth and final theory is it's a Chupacabra-esque being. Even though it's normally spotted in the southern United States, Mexico, and Puerto Rico, the Chupacabra's work is a worldwide craze. Whether you believe it to be the work of occultists, aliens, alien pets, or simply canines is on you. As for the creature seen here, it does largely fit the description of the Chupacabra: furless, canine in appearance, and it even has the oddly bent legs. The only thing it's missing—and something that I've never seen any alleged Chupacabra corpse ever have—is the row of spikes running down its back. That said: most Chupacabra corpses and sightings are blamed on canines (typically domesticated dogs) with mange. We covered that before and everything said there applies here. So pick which you believe: mangy dog or bloodsucking alien dog. The Wessex Way Monster/Werewolf is definitely a weird little mystery. It came and went in the course of a few seconds. While the United Kingdom certainly has its fair share of weird creatures, I'm not sure any match the appearance of the one seen here. That leads me to believe it was likely a dog with mange, or perhaps some strange monster on a cross country road trip. What do you all think? Strange genetic mishap? Possibly a dog? Some undiscovered species? My best guesses anyway.